Life, Doctor Who & Combom: Doctor Who Game Maker Launched! 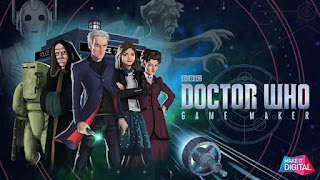 Doctor Who Game Maker Launched! It requires no technical knowledge, no download and works on desktop and tablets meaning you can get creative whenever and wherever you want! The Game Maker allows you to build something simple in minutes before moving onto more complex ideas as you get the hang of it. You’ll also be able use the arcade feature on your mobile so you can play games on the go. But be careful… It’s addictive! Within minutes you can create a fun game from scratch, or use one of a selection of templates to help get you started! Templates include classic game formats with a Doctor Who twist, such as platform games, puzzles and racers. There’s a vast range of assets on offer to help you create your own unique games – including stunningly designed environments, monsters new and old, friends, foes, and spaceships from across the galaxy. The Doctor’s old Sontaran friend, Strax, is on hand to offer advice with a range of helpful guides that show you how to get started, change the games’ physics to make things fly, animate objects and even add special effects. And there’ll soon be an Arcade area letting people play games made by users from around the world!